kcals4health is the ultimate diet planning tool to help you achieve your weight management goals. Calculate your calorie and nutritional needs and log your daily food intake. Database includes over 8600 food entries taken from the USDA foods database. Food databases from other sources are available for download from this site. Count more than just calories. See the breakdown of those calories between the major macro-nutrients: carboydrates, fat, protein and alcohol. 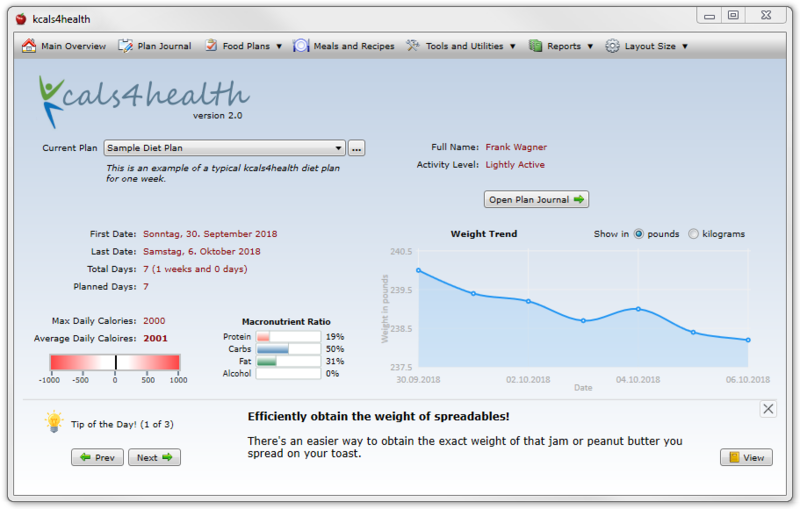 Instant summaries allow you to manage and plan your calorie intake and macro-nutrient ratios to achieve weight loss. Add food items to your favorites list for fast selection. Add custom food items to the database on the fly. The main overview allows you to see everything at a glance. You can create multiple plans and select the current plan you’re working in. You can view your overall progress: your average daily calories and macronutrient ratio. A chart shows your weight loss progress.